Those of you who have followed my blog for pretty much any amount of that know I’m more of a meal in the crock-pot and beer in the fridge type of party host. However, for my best friend’s baby shower, I really wanted to go all out and make it a super special day for her, and I think I did a pretty great job! I tried to keep the entire party in the yellow & turquoise theme since those were the colors of her nursery already, and I wanted her to be able to use any of the decorations she wanted to keep after the party. Since this themed-party stuff doesn’t come to me naturally, I spent a LOT of time cruising Pinterest for ideas. 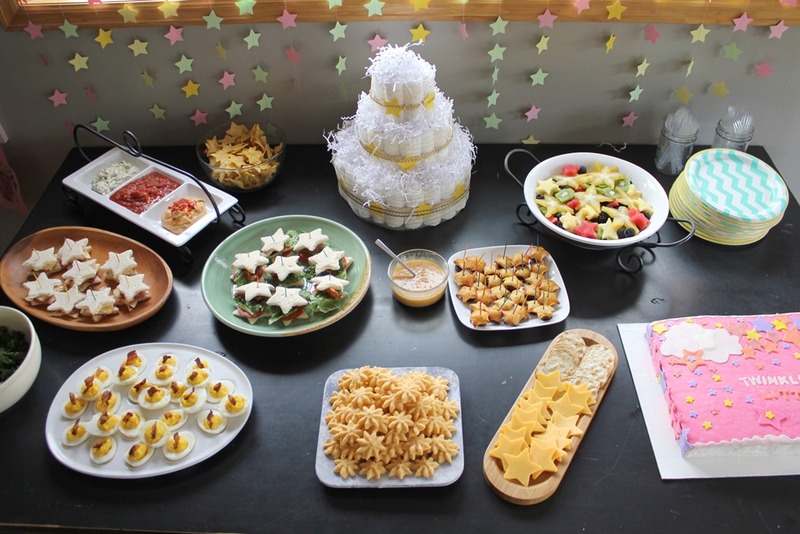 I figured it might help somebody else if I linked everything here in one place in case anyone else wanted to use a similar theme for their baby shower or kid’s birthday party! It all started with the party invitation. 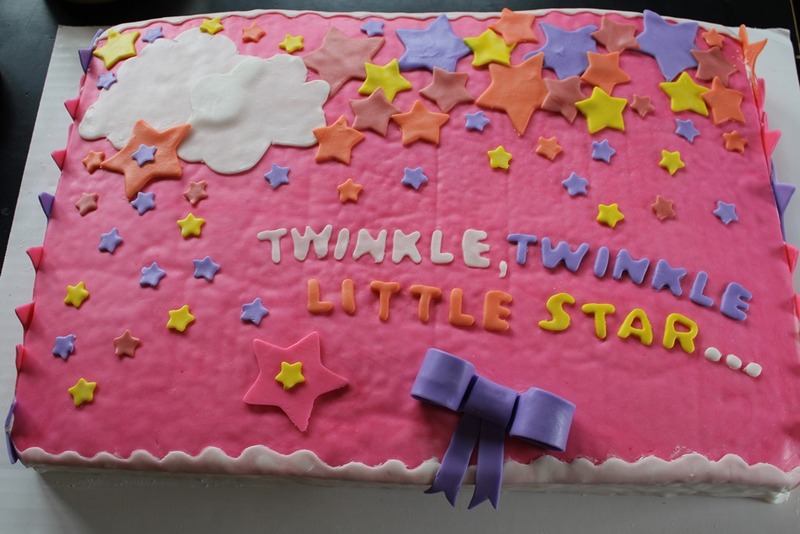 My friend wanted me to just do an e-vite, so when I found this twinkle twinkle themed baby shower invitation, I was stoked! 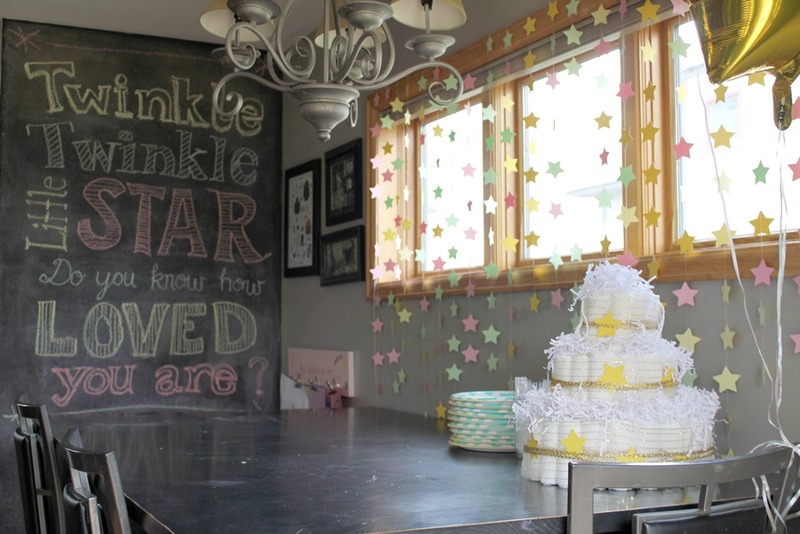 It totally matched the colors of her nursery, and I thought it was an adorable theme for a baby shower. I normally don’t buy clothing for baby showers, just because people tend to get a lot of clothing gifted to them and not so much the boring essentials that they actually need in those first days and weeks and months. In this case I figured they could double as a fun decoration though, so I went to the local second hand children’s clothing store and scored everything you see for about $25 total. Not bad for a cute decoration I could send home with the Mommy-to-be! I saw this idea on Pinterest and immediately knew I wanted to do some variation of it. 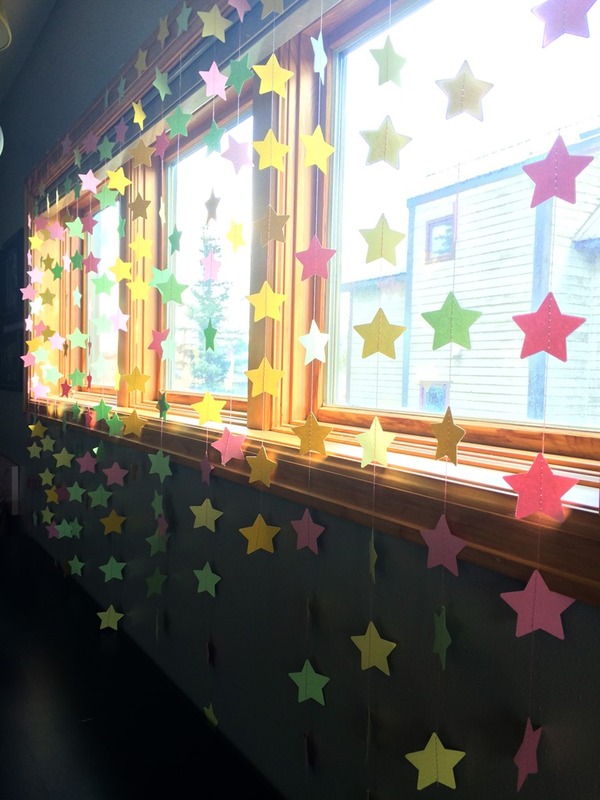 I bought a pack of cardstock paper at the local craft store along with a star paper punch, and Stella helped me punch out a bunch of stars. I gave the stack of stars to a friend who is good with a sewing machine, and she sewed them into strands for me. I just taped them to the top of my window sill behind the dining room table where the food would be served for a little extra ambiance. I LOVE how they turned out, and the baby mama wanted to take them home to hang in the nursery window afterwards. Score! 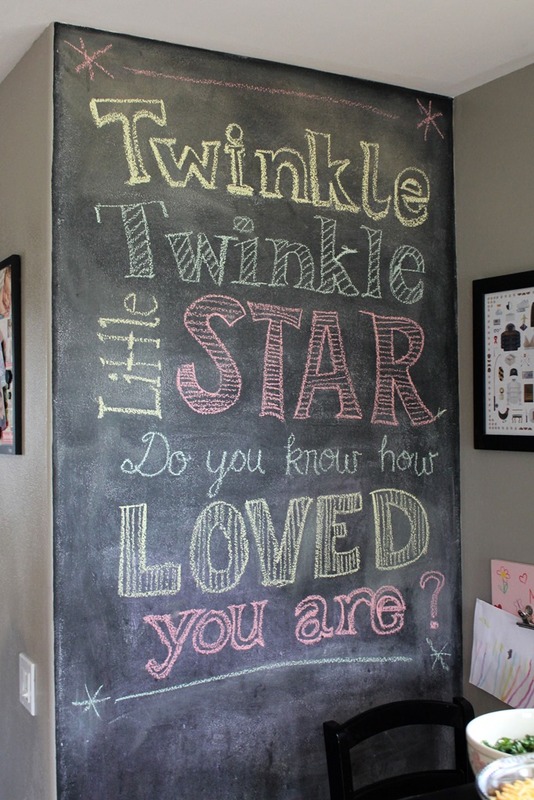 A few months ago we did a DIY project (a magnetic chalkboard wall) next to our dining room table, so as soon as I saw this printable on Etsy, I knew I wanted to try to recreate it in large version on the wall. SO many people commented on it – and best of all, it was FREE! I feel like diaper cakes are a pretty standard decoration at baby showers now days, but maybe I’m wrong? My 3 year old thought it was SO silly that we made a diaper cake, because “people don’t eat DIAPERS, Mama!” 🙂 Here is the tutorial I followed. I just bought a 100pk of size 1 diapers off of my friend’s baby registry, a bag of rubber bands, and a couple decorations from the local craft store, and bam! After my kids and husband were in bed one night, I stayed up late watching my TV shows, having drinks and building a diaper cake. Not a bad night! My friend made these so I have no idea what recipe she followed. Apparently they’re kind of like cheese straws and are a Mississippi thing? People loved them! These were deceptively easy to make! 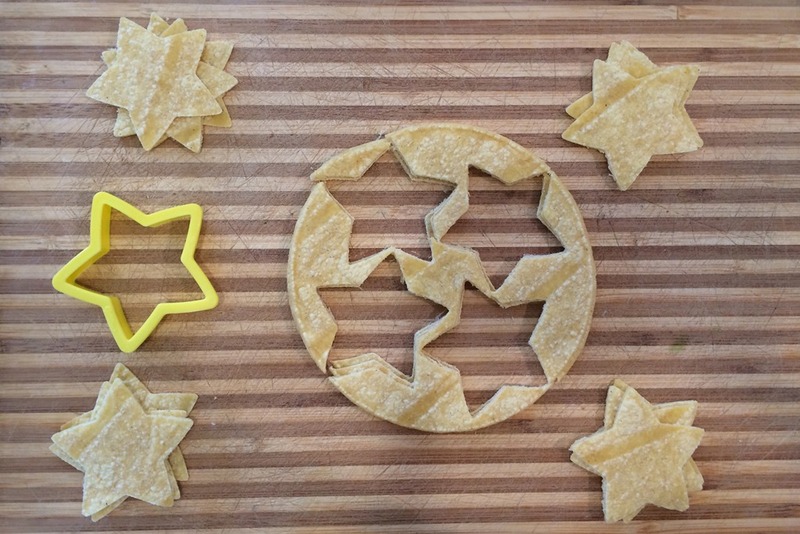 I just bought a pack of corn tortillas, cut them into star shapes with a cookie cutter, and brushed them with oil before tossing them into the oven. Follow the instructions here. 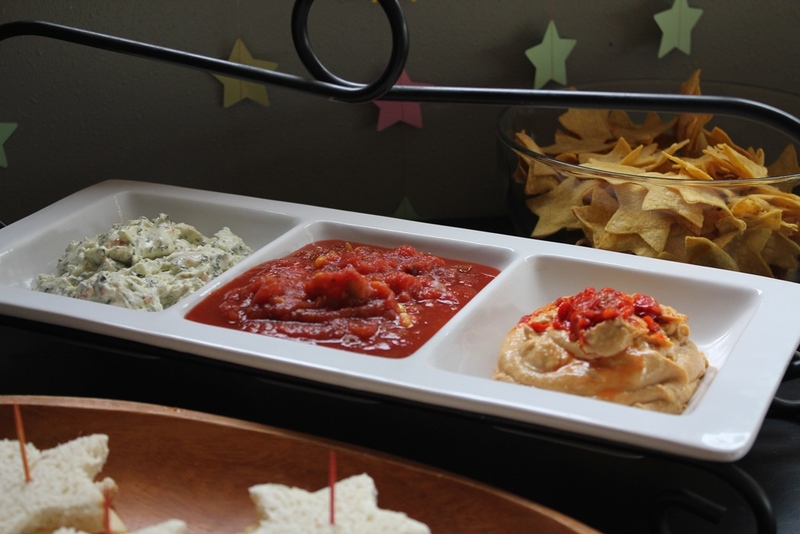 I paired these with a little sample platter of hummus, salsa, and a cheese spread. Delish! 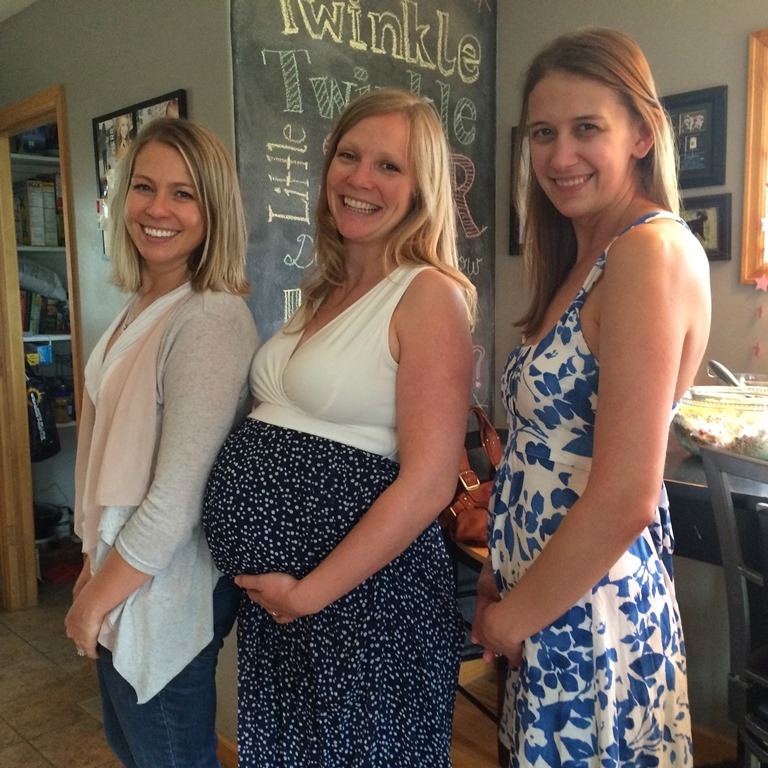 My friend is a HUGE watermelon fiend – and that’s when she’s not pregnant. Since getting pregnant, she can basically eat an entire melon in a sitting, so I knew I wanted fresh fruit as one of the food selections. 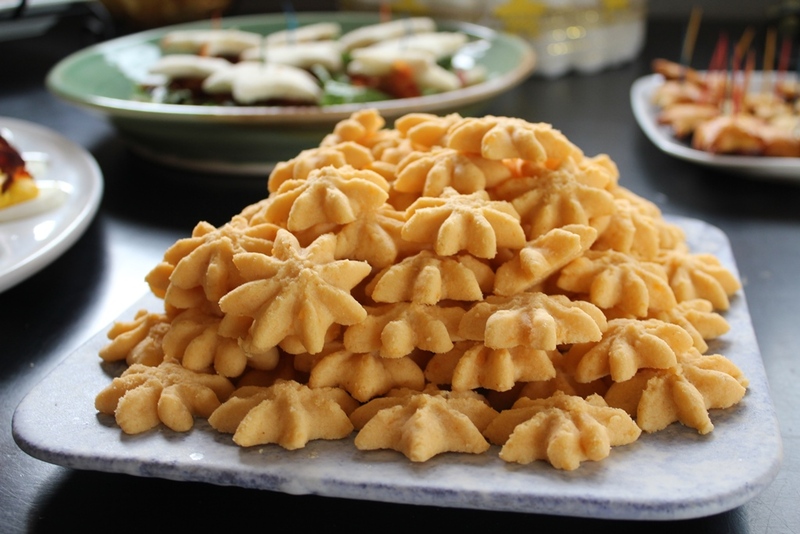 Since I had bought a pack of assorted sizes of star shaped cookie cutters, I bought cantaloupe (aka – “muskmelon” if you’re from MN! 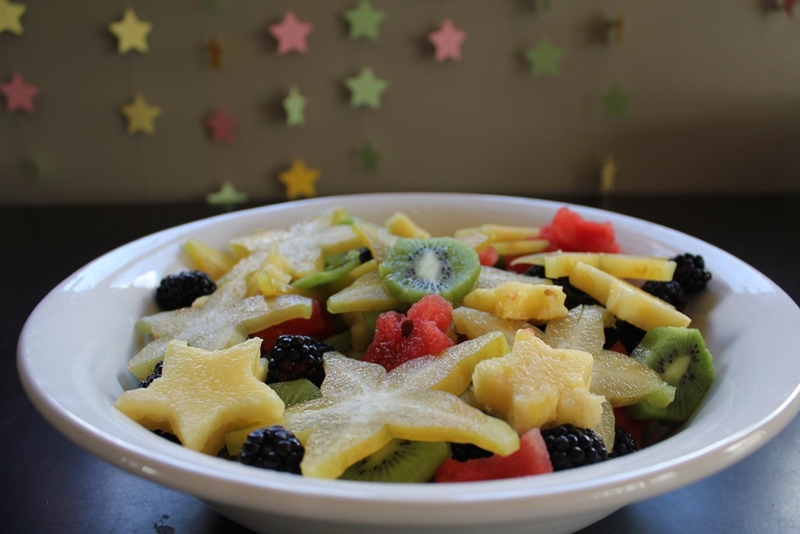 ), watermelon, and pineapple to cut into star shapes. I also bought a star fruit (fancy!) and some blackberries & kiwi for color contrast. I found this link and just knew they’d be delicious! 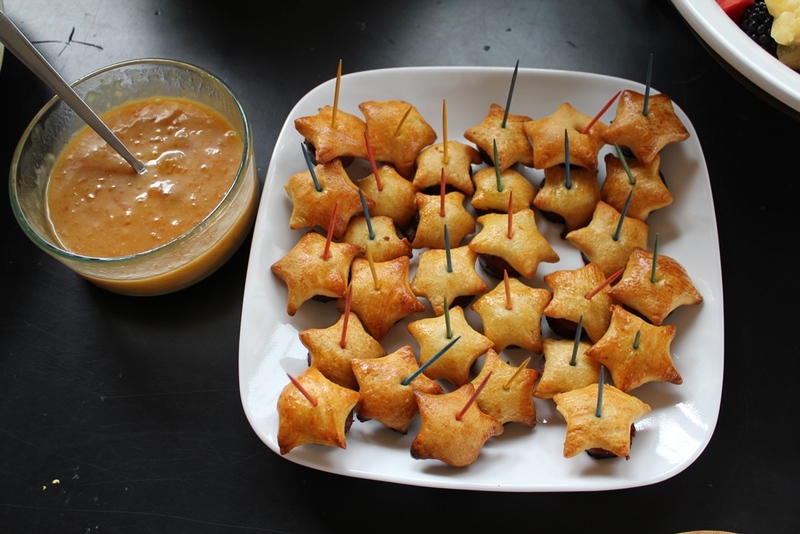 I prepped them about 3 hours ahead of time and waited to bake them which made the pastry fall and not be so fluffy (oops), but they were still super tasty – especially when paired with that dipping sauce! 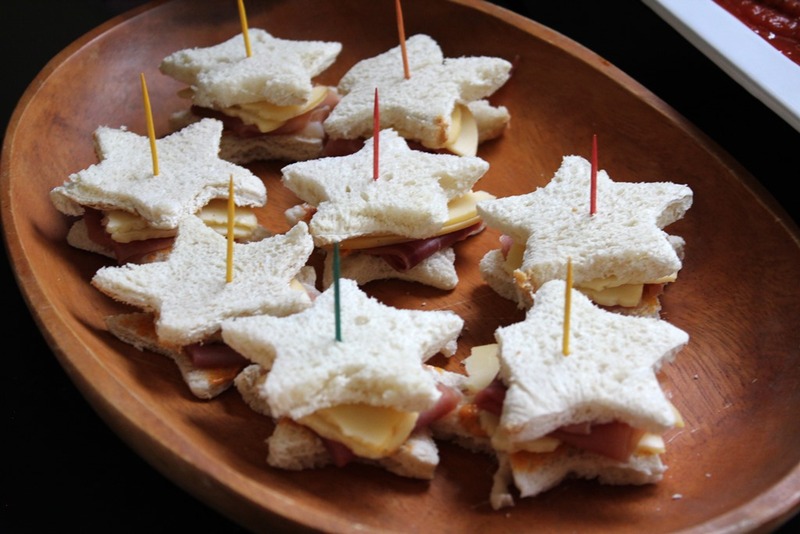 I’ll definitely make these for a football party or something in the future. Pretty self explanatory on this one. 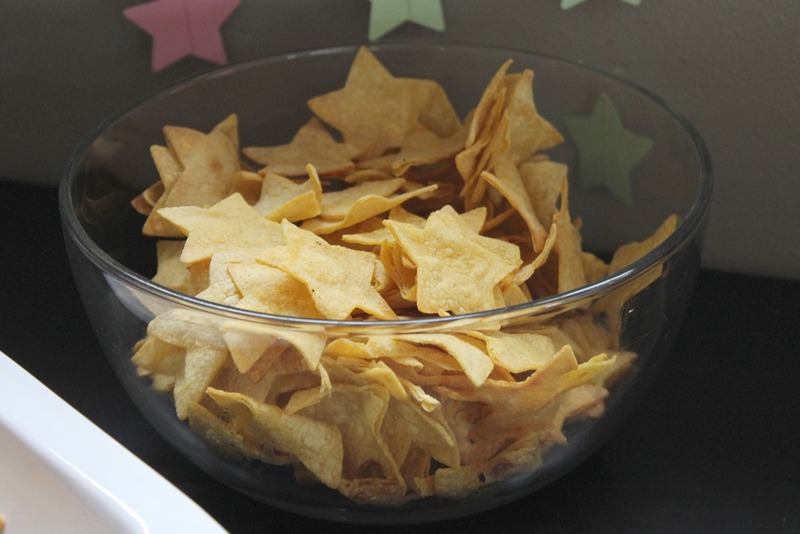 🙂 I just cut out star shaped cheese slices (and saved the extras for melting / snacking on) and arranged them on a try with some water crisp crackers. Delish! 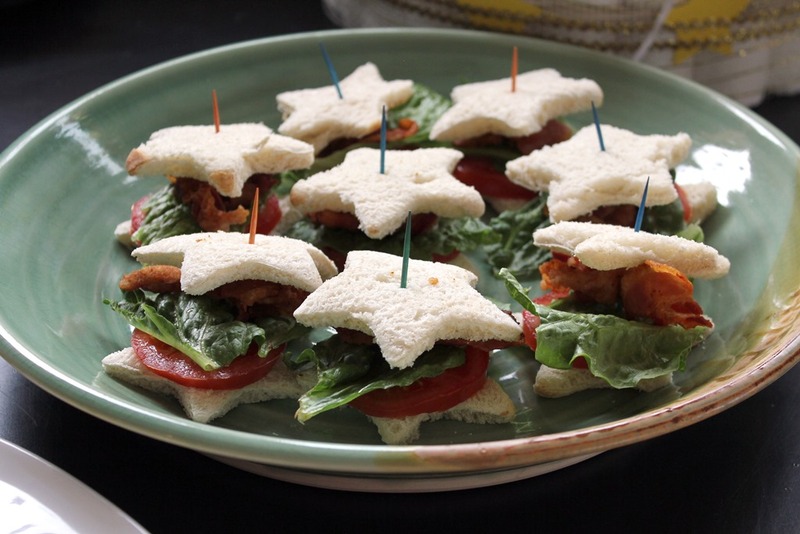 I did two variations for the party – a classic BLT and a prosciutto/gouda cheese/chipotle & mayo spread (I used Board’s Head Fiery Chipotle Gourmaise). I also saw PB&J versions for a kid’s birthday party! I meant to toast the bread before assembling so they’d look more like this, but two of my girlfriends came over 30 minutes before the party and I wasn’t ready yet, so I had them assemble the sandwiches while I finished getting dressed. Afterwards I thought OOPS(! ), but everyone still loved them. The last item I had wanted to do were these puff pastries. 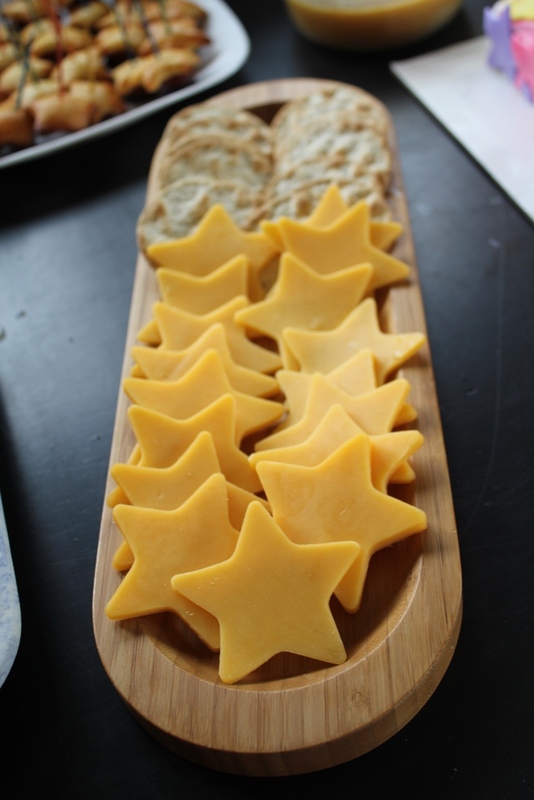 My friend that was going to make them had a wee kitchen explosion that morning though, so instead she brought these stars from Trader Joe’s because she had them in her cupboard. They were a hit, of course! Oh! And last but not least, one of my girlfriends took a cake decorating class on a whim last year, and she’s gotten really good at it! 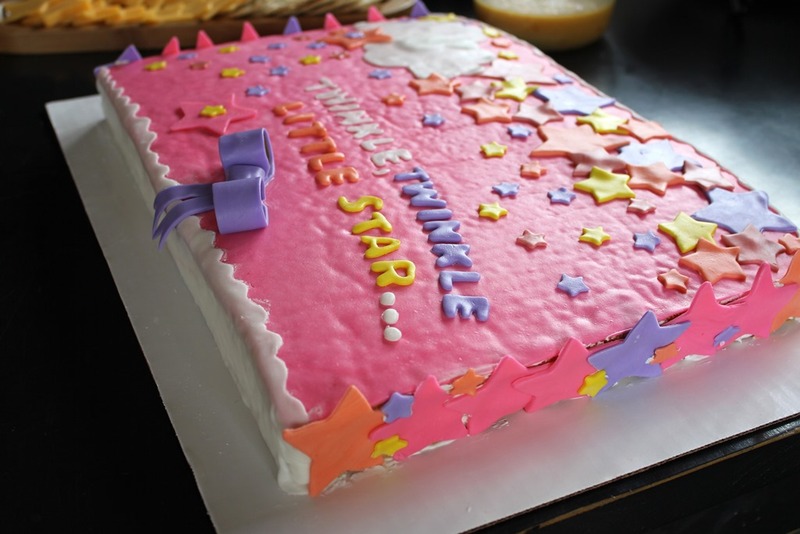 I asked her to make a star cake for the shower, and this is what she came up with. I loved it! Good on you – WOW! That’s a lot of star cut-outs! 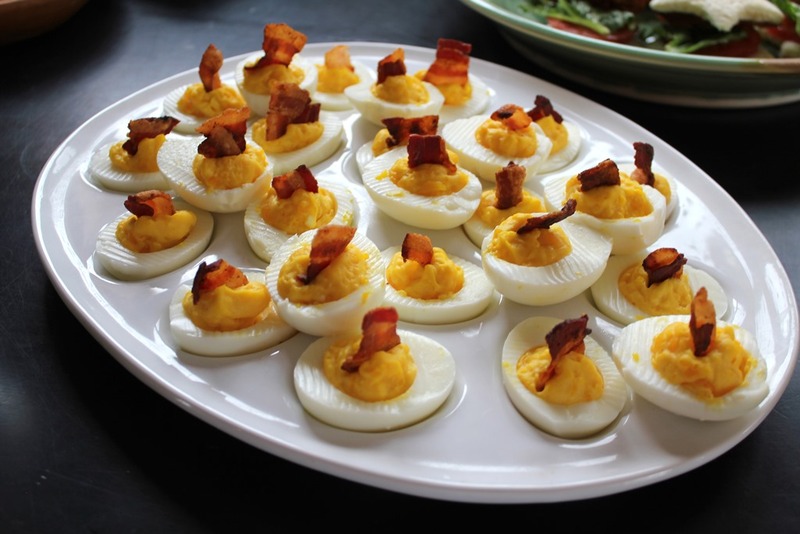 I like to go all out for parties too, but more on the decoration and invitation side of things with food in normal shapes. HA! You worked SO FREAKING HARD! I bet she loved it! Tres, tres awesome. Also I’ve been meaning to say that we made the frittata recipe that you posted last night and it was a hit with all 4 members of the family. This rarely happens. I needed that food win. Thank you! The recipe is in permanent rotation from now on. You, my friend, are a fricking rockSTAR. You made this such a fun, personal, sweet party! I am majorly impressed. 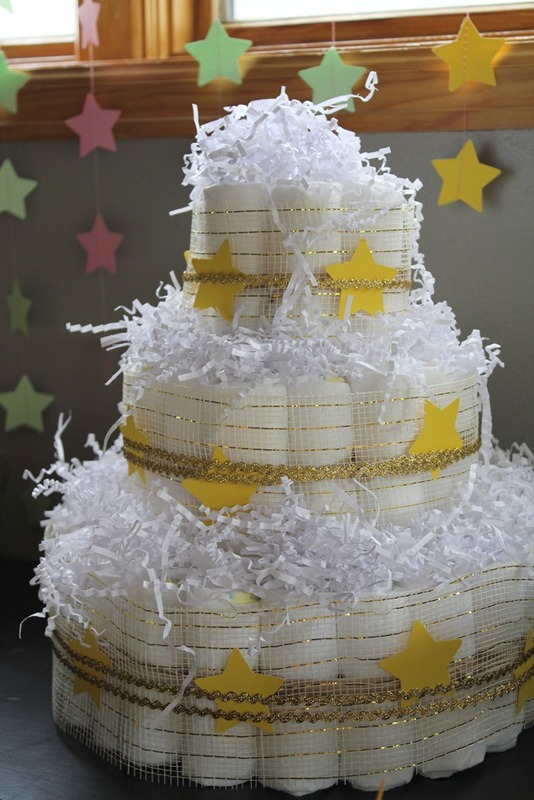 And I love the diaper cake – you definitely have to look twice to realize that it’s diapers. Also, you look wonderful in that last picture. Glad you kept that cardigan. It’s flattering and you seriously look slim. Everything about this is awesome, Josey! !